I love food. I love to make it and I love to eat it (but mostly make it). Every Friday I intend to post a new recipe for you to try. I won't post it unless I have tried to make it because I want to know it is good. Well, as most of you know, Tyler and I have been together for a while. A long while. And during that long while, we have developed favorites... then decided on new favorites. For example: our favorite Chinese restaurant was in the mall in the town we went to college. Not it isn't our favorite anymore because we have a new favorite in the mall where we live. 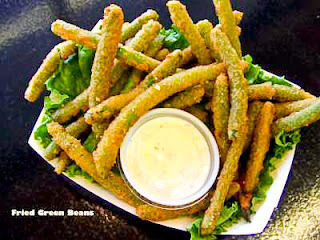 One favorite that we still love (even though we don't eat it as much as when we first discovered it) is a lovely/delicious/wonderful appetizer of fried green beans. Yum, yum, yum. Us women go through those stages where we say "I need to eat healthy" or "I need to find some healthy recipes! ", you know what I'm talking about, don't deny it. Well while I was on this kick (one of those 939,124,223 times), I bought a cookbook. It is called Hungry Girl and it actually has some VERY creative recipes!! As you guessed, today I am going to share the recipe with you. Combine all of the ingredients for the dip in a food processor and blend until smooth. Cover this and put it in the fridge until you are ready to serve. Put all of the beans in a large pot of water and boil for 9 minutes. You will want to drain them carefully so they don't fall apart and stick them in some cold water to stop the cooking. Either pat them dry or let them air dry. Put Fiber One, garlic powder, onion powder, salt and pepper in the food processor and grind till fine. Cover a large baking sheet with foil. Place the egg substitute in a small bowl. Now, the fun part. Place 1/3 of the crumb mixture into a large plastic bag. One by one, dip the beans in the egg and shake them in the bag till covered. Repeat until all of the beans are gone or all of the crumbs are gone.Bake for 15 minutes making sure to flip them about half way through. Serve with dip and enjoy!! Your turn! Go ahead and LINK UP with Food Friday! I would love to see what you've got cookin'! I have two new cookbooks so look forward to more (amazing) recipes!!! I just got home from visiting with Tyler's grandpa at the rehab center (recovering from surgery) and I have to say, sweetest man ever. I intended to just drop in quick and drop off the Christmas picture I put together for his wife to send out, but couldn't help but to stay and chat. He is a rock star and recovering well. Now I am off to celebrate the much needed weekend. No big plans (other than posting an OUTSTANDING giveaway tomorrow (valued at $38)!! But that recipe sounds good! Yummy! I had tempora vegetables in mexico once & they were divine. I'd never had them before! Food Friday - Donuts... Yum.